2003 solo debut from co-founding Killarmy member 9th Prince and younger brother to The RZA! Granddaddyflow features production by 4th Disciple, True Master, and The RZA (plus a guest spots), with appearances by Rubbabandz of GP Wu, and Killarmy cohorts Islord and P.R. Terrorist aka Dom Pachino. Nice to see this re-issued...Wu-fans will want to scoop this up! 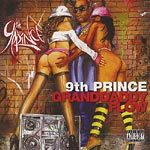 Produced by 9th Prince (track 1); Rebel Danja (2 & 3); 4th Disciple (4 & 5); Storm (6 & 12); Freedom (8 & 14); Cheese (9); Falling Down (10); True Master (11); Rza (13).